BELL (Carey) (aka Carey Bell Harrington) Macon, Mississippi, November 14 1936 – Chicago, Illinois, May 6 2007. His godfather, the piano player Lovie Lee, brought him to Chicago in 1956 to join his orchestra. He soon became friend with Little Walter who’d let him sub for him at Club Zanzibar when he was unavailable or too drunk. He would also spend time with Rice Miller and Big Walter Horton with whom he recorded a very nice duo album for Alligator. 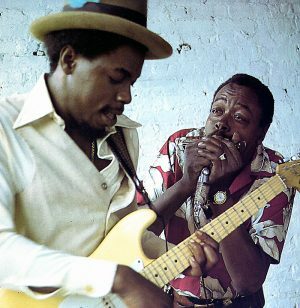 Carey Bell became one of the main blues harmonica player of the Chicago scene in the 1970s. 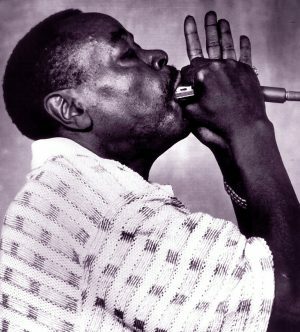 Carey wanted to play the saxophone like his idol Louis Jordan, he had to make do with a harmonica. Carey Bell also learned how to play the bass in order to get more gigs and live from his music. He played in Hound Dog Taylor and Robert Nighthawk bands. Later on he toured with the famous American Folk Blues and Chicago Blues Festivals accompanying Muddy Waters and Willie Dixon. As a leader he started recording for Arhoolie but his first LP was on Delmark. He then went on and record for many labels. Mellow Down Easy is one of his best album (Blind Pig). Carey Bell used a lot of mouth effects or even screaming through an amplified microphone. His son Lurie Bell also made a nice career in the modern Chicago blues genre. Carey used to play the 16 hole chromatic harmonica quite often (Hohner Chromonica 280) mostly on minor blues. His playing was influenced by Big Walter Horton and Little Walter even tough his tone and playing stand out as a unique voice.